July 20, 2011 A new filing in the King Lincoln Bronzeville v. Blackwell case includes a copy of the Ohio Secretary of State election production system configuration that was in use in Ohio's 2004 presidential election when there was a sudden and unexpected shift in votes for George W. Bush. Moments later two red lights broke through the low clouds, heading almost directly toward the ground. It was a light aircraft, and for a second, as it descended below the tree line, the man thought it would climb back up. Instead, there was a terrible thud, and the sky turned orange. When the fire crews arrived, they found the burning wreckage of a Piper Saratoga strewn across a vacant lot. The plane had narrowly missed a house, but the explosion was so intense that the home’s plastic siding was on fire. So was the grass. The pilot had been thrown from the plane and died instantly. Body parts and pieces of twisted metal were scattered everywhere. A prayer book lay open on the ground, its pages on fire. After the 2004 election, five weeks before his "suicide", he called out the American people for their apathy and moral cowardice. "What this election tells me, unfortunately, is that it doesn't matter to most Americans if their government lies to them repeatedly. They no longer care if their leaders erode their civil liberties, push this country further towards a police state, or shroud their actions in additional layers of official secrecy. They don't mind if their government operates strictly for the benefit of the rich and the corporate class, as long as their own taxes don't go up. Nor do they care if their government spends itself to the brink of bankruptcy. As long as they feel threatened by some external evil, everything is permitted." Hope for Change or Change Your Hopes? "Some say" that no matter who gets elected we're still going to be in Iraq, the bailout will continue, and there will be no drawdown of the bloated budgets, particularly the military, that feed the defense contractors their daily ration. We're not getting national health, rather an electronic exchange and so forth down "the middle of the road" of national leadership. Here's some news from the election fraud segment of our precipitous decline thanks to greed and avarice, not to mention stupidity, on the part of the ruling elite. Everyone of the problems mentioned could be solved without much cost in a few months. Everybody in power knows that and only a few officials act to serve citizens. They're rarely rewarded and frequently punished and marginalized for their service. Think it doesn't matter who wins the election? Voter Roll Purges are being reported by Daily Kos, Greg Palast, and DemocraticUnderground. 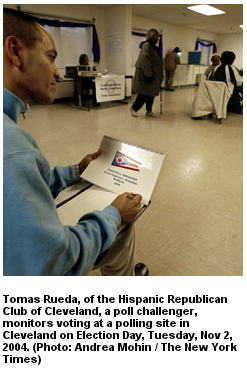 In swing-state after swing-state Republicans are purging every voter they can. Most of them likely to vote for Obama. In Colorada 1/5 of voters have been purged.